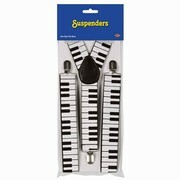 If you need an easy way to move your digital piano around, these digital piano dollies are what you need. Perfect for schools, churches, auditoriums, etc. Any place where you have to move the piano around frequently. This model features sturdy construction, black powder coat finish, and America made "double wheel" rear casters and 2 single wheel "locking" front casters. Width is 47" x 68", Depth is 15" x 22". 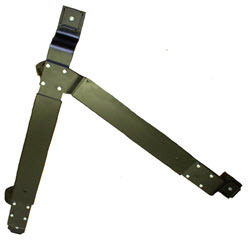 Also features 9-1/4" x 15" metal plate designed to support the piano pedals. The dolly will raise the piano about 1" off the floor. 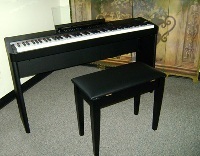 Manufactured by Paul L. Jansen & Son, makers of the famous Jansen piano benches. We MUST have the make and model of the digital piano you plan to use the dolly for. Our supplier will not ship without this information. If they cannot match your model with the information they have on file, we may need you to supply pictures. We have listed some brands and models below under the dolly they need. Some digital pianos require the dolly to be made with a deeper center plate (14" deep vs 9-1/4" for the standard) at an additional cost of $50.00 (J4004D). We will notify you if this is the case, before we ship. 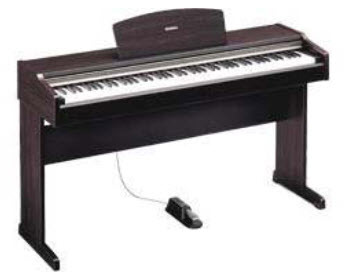 Examples: Yamaha YDP 181 and Yamaha CLP 635 can use the basic dolly, but the Yamaha CVP 301 Clavinova requires the J4004D (deeper plate). This is only a partial listing, please contact us if your digital piano is not in this list.